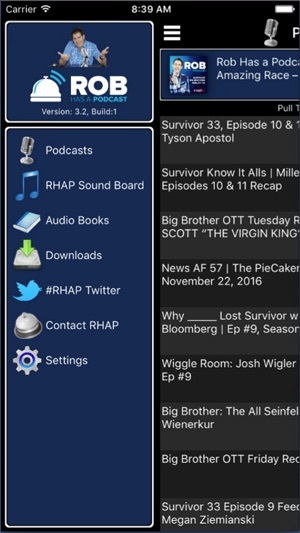 The award-winning "Rob Has a Podcast" (RHAP) now brings you "Rob Has an App". 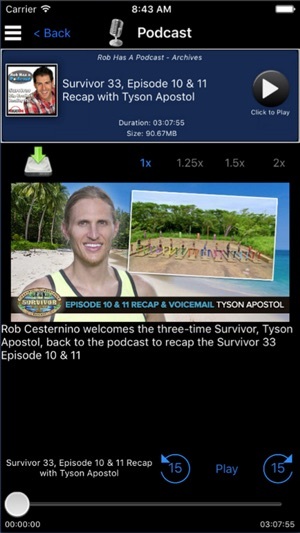 Rob Cesternino, former contestant of the TV show "Survivor", hosts a wide array of TV related podcasts and interviews, all easily accessible from your mobile device. From reality TV hits such as Survivor, Big Brother and The Amazing Race, to scripted blockbusters like Game of Thrones and The Walking Dead, find all your RHAP content right here. 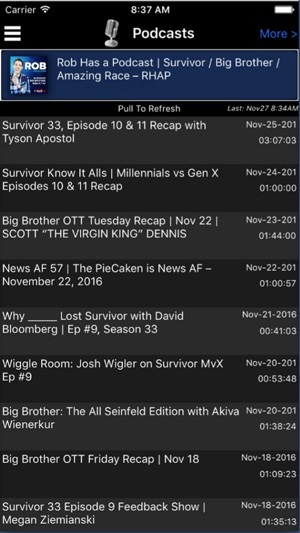 Love the one stop shop for all the RHAP apps! Much easier to navigate and choose podcasts than in the Apple podcast app. The only thing that drives me crazy is the same thing the last reviewer stated which is that the app does not resume playing if you do something that interrupts the audio, such as voice text, receive a phone call etc. since I listen to podcasts mostly when I’m driving, the implementation of this feature would offer more safety when driving as well as improve the overall experience. I saw the developer said he would add this in the next release but there’s been a few updates this year and it still doesn’t work. Other than that one thing, love the app. I’m a huge fan of RHAP and a big reality nerd- so this app is perfect for me. 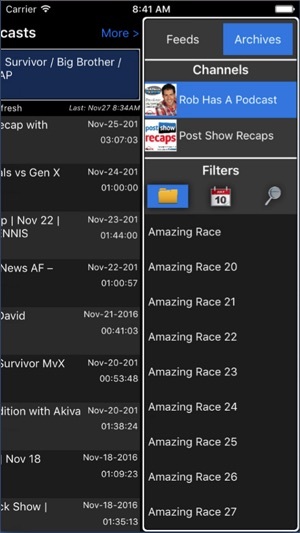 It’s a great way to easily access RHAP archives without having to search the website. It’s easy to navigate and runs smoothly. It’s quickly become one of my favorite apps. This app is easy to use, especially in comparison to apple podcasts, sorry Apple, maybe you should hire Eric.